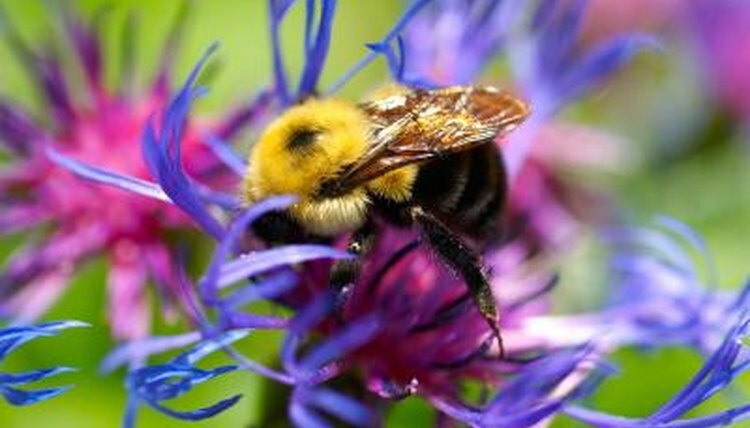 Roughly 25,000 species of bees exist worldwide, with around 4,000 of those residing in the United States. Depending on their species, some bees live in large colonies, whereas others are solitary and nest alone. Although the terms are sometimes used interchangeably, beehives and bees' nests are different from one another. Beehives are man-made structures inside which bee colonies make their home. They're only classed as hives if the structure was intentionally meant to house bees. Generally only honeybees live in hives, because no other types of bees have any commercial value. If a swarm of bees -- a group without a home -- turns up in a populated or inconvenient location, local beekeepers will usually be happy to collect the swarm and put it in an unused hive. The difference between bees' nests and beehives is that nests are naturally occurring. Honeybees can form nests by themselves, rather than living in hives, but all other species of bees make nests, too. More often than not, bees choose to build their nests in isolated locations, but occasionally they'll cause a nuisance by nesting in lawns or roof cavities. All kinds of bees' nests exist, varying wildly according to their species. When you think of a bees' nest, you probably think of a large, busy honeybee colony. However, different kinds of bees make different types of homes. Bumblebees are social and make nests not dissimilar to honeybees', but these nests are much smaller, as the average colony size is 50 to 400, compared to 50,000 to 60,000 for honeybees. Bee species belonging to other families are solitary, and don't nest in colonies. Mason bees make nests in cracks and crevices, leaf-cutter bees nest in hollow stems or holes in wood, and digger, carpenter and mining bees make their nests in holes underground. Honeybees have the largest and most complex homes of all types of bees. Their nest or hive has to be made in a space with a volume of at least 6 1/2 gallons, so there's room to store enough honey to see them through the winter. The comb makes up the main structure of the nest and is made from a wax that's secreted from the abdomens of worker bees. These combs are used to store honey and pollen, and act as a nursery for baby bees. Three types of bees live in the colony: the queen, of which there's only one adult; workers, infertile females who make up 85 percent of the population; and drones, males whose only purpose is to mate with the queen.